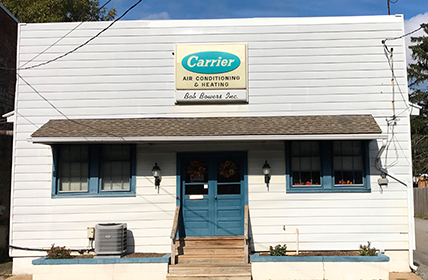 Founded in 1948, Bowers Refrigeration was one of the first commercial refrigeration companies in Carroll County Maryland. In 1965 we became a Certified Carrier Dealer, selling and servicing Carrier Heating and Cooling equipment. Incorporated in 1975, BBI moved to its John Street location and set up a complete sheet metal shop, office and retail store. We are able to design, fabricate, install and service all types of residential and commercial HVAC systems from one location. Every phase of your job is handled by our competent employees or under our direct supervision. Still a family business, BBI takes pride in each and every job sold with a satisfaction guarantee. We have built a team of experienced air conditioning and heating professionals dedicated to quality, something you can always count on when dealing with BBI.